Apologies for the radio silence but a busy week plus serious website problems conspired to keep me off-line. Website issues persist still (how unlucky am I with technical problems? First FB and now WP!) but I can at least post now; hope to have the Follow via e-mail functionality back up and running soon. What a wonderful night we had last Monday! Great to have had the perfect combo of new faces and old hands. Highlights for me were April is in My Mistress’ Face and Christe Jesu, Pastor Bone but you all will have had your favourites (and least favourites too, no doubt); feel free to comment on them below. Next session details are here, including our brand new poster (I am going to start giving masterclasses in how to produce mediocre publicity materials using just Microsoft Word). PDtP sessions are now listed on Eventbrite so you can sign up to them just like many of you used to via FB. Of course you don’t have to do this – it’s a drop-in music night after all – but if you do then it’s a handy way for me to get an idea of voice numbers, which in turn helps when planning the rep for the night. Thanks again to you all for your continuing support and I look forward to seeing many of you at the next PDtP. Just a reminder that we will be recording excerpts and taking pictures at tonight’s PDtP for possible inclusion in R3’s Meet My Choir, so please bear this in mind in case you are worried that Interpol might catch up with you as a result. As Bach chorales are usually a staple of the sessions (they should be a staple of all singing events at all times and I include The X-Factor in this assertion), I am chucking the final chorale of BWV10 back in the mix. Some of you will remember it from PDtP 6 and it really is the most brilliant 50 seconds of choral music you could wish for – simultaneously archaic and utterly fresh, a pure pleasure across all 4 parts. It has been added to the sheet music folder on Box so grab it via the usual link. Thanks again and see you at 7! Hope you are all looking forward to Monday’s PDtP, which, as always, is sure to be the best one yet. I would be there myself if I wasn’t already otherwise engaged so if anyone does go, please let us know if you enjoy it. I haven’t heard of this young ensemble before but it sounds like they are all about performing great music in unexpected places, which is of course how we also like to roll. PDtP 8 sheet music is ready! Another setting of Shakespeare by one of his contemporaries is Morley’s It Was a Lover & His Lass, alongside two more of his madrigals. Other gems are Dowland’s Fine Knacks for Ladies, Sheppard’s The Lord’s Prayer, and Taverner’s Christe Jesu, Pastor Bone. Of course, it wouldn’t be a celebration of English Renaissance choral music without those perennial favourites, Byrd’s Ave Verum, Tallis’ If Ye Love Me and Gibbons’ The Silver Swan. And a final highlight: as it’s PDtP VIII, we have a jolly little number by none other than Henry VIII, which will surely make it all a right royal knees-up! *At least I think it’s the actual first setting; didn’t have enough time to verify it! Posted on April 7, 2015 Leave a comment on PDtP 8 sheet music is ready! …but just in case you did need a prod, we are going to be recording some segments that we hope may be used on a future Meet My Choir, a regular segment of Radio 3’s The Choir programme. 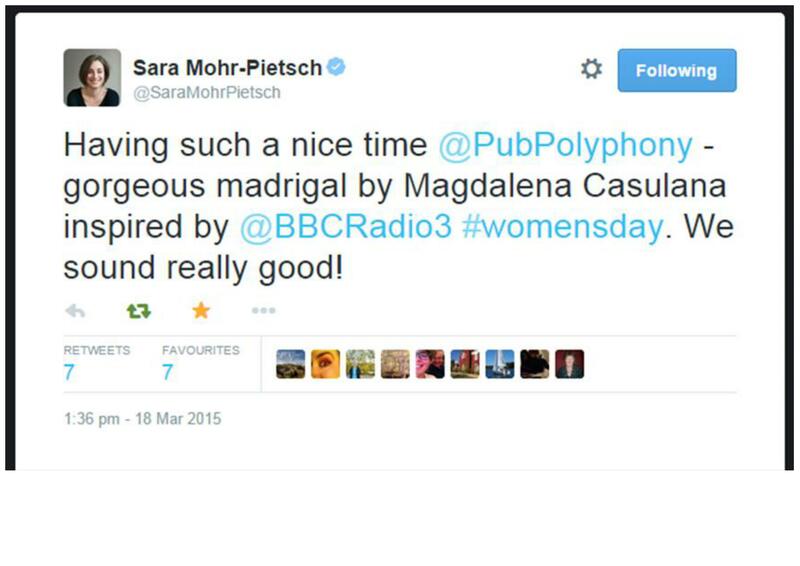 Sara Mohr-Pietsch, presenter of The Choir, came along to the March PDtP and was kind enough to suggest that we submit a recording and some info for her programme. OK, so we are technically not a choir, but the programme is about celebrating singing in all its forms and so our unusual event might be of interest to the British public. Once again, there is no guarantee that we will make it on to the programme but it would be nice to give it a try; I am really hoping for a nice, big sound for a brief recording so please do come and bring your singing pals with you! Here’s a reminder of the details of the next session on April 13th. Welcome to Polyphony Down the Pub! 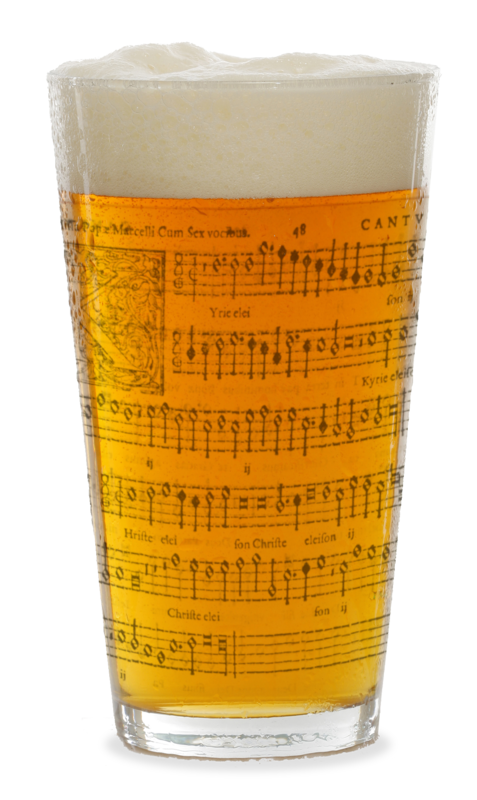 If you are new to PDtP/Counterpint and want to find out more about the UK’s most exciting Renaissance-motets-in-a-pub events, check out our FAQs. Sign up to e-mail updates on the left hand side of this page to make sure you don’t miss out on sheet music links and other useful info, and follow us on Twitter: @pubpolyphony & @counterpint and Facebook. Posted on March 31, 2015 April 10, 2019 Tags Polyphony Down the Pub, singing, social4 Comments on Welcome to Polyphony Down the Pub!